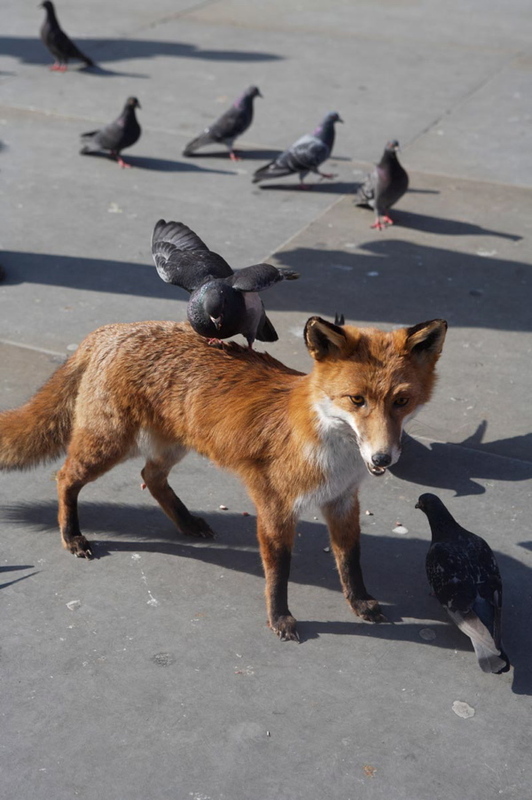 At this time of year, as the shadows get longer, the foxes of the East End grow bolder, reclaiming their territory. 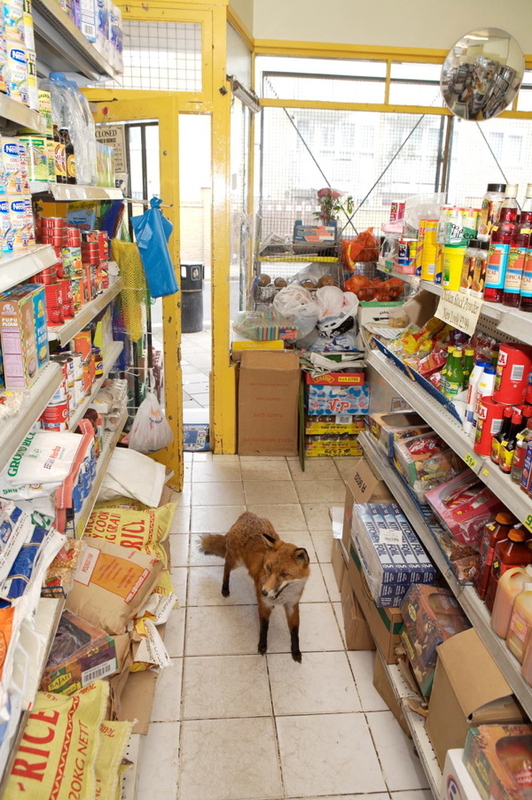 Those that have acquired a taste for curry come streaming down Brick Lane in the early hours to pillage the bins, and throughout Spitalfields you may even see foxes during daylight hours skulking in the side streets, as familiar with humans as we have become with them. 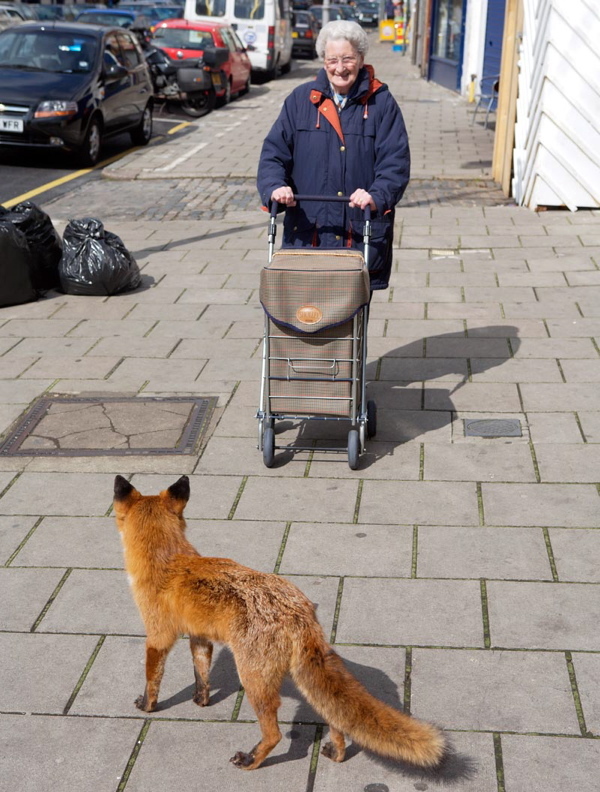 Consequently, I did not blink when I caught a glance of the first of Spitalfields Life Contributing Photographer Martin Usborne’s fascinating fox photographs. My immediate assumption was to admire his skill in capturing a rare moment – until I saw the other pictures and realised that a sly ruse was involved. Now that digital manipulation of photography has become commonplace, there is an elegant poetry in the plain contrivance of taking a stuffed fox and placing it in the street, because a natural correlation exists between the still life of taxidermy and the frozen moment of a photograph. 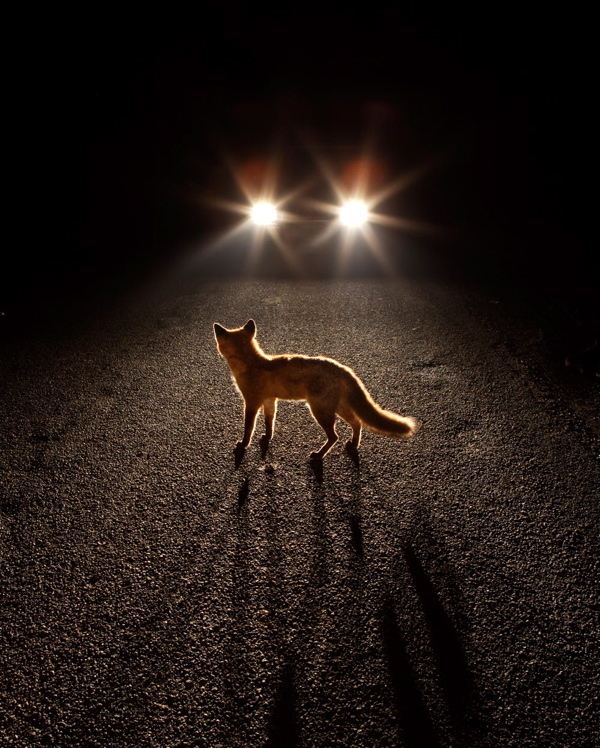 So familiar are we with photography as a record of an event that we naturally imagine the movement before and after the frame, an impulse that still exists even after we know the fox is immobile. 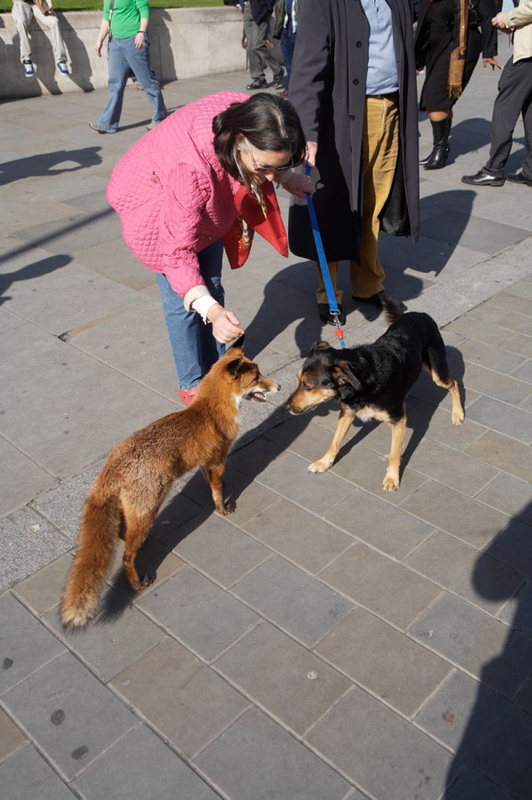 There is also the delight of complicity here, in observing how different people gamely participated in Martin’s project, when he spent three days wandering around with a dead fox that he rented from “Get Stuffed” taxidermy hire in Islington. (Martin was assured that the fox died of natural causes and was given to the taxidermist by the RSPCA.) The comedy of the undertaking is irresistible, even if it is underscored by the poignancy of this displaced creature returning to its urban habitat after death. Athough foxes are common in the city, the surrealism of their presence never fails to startle, and these cunning photographs play upon this familiarity, pushing the limit of credibility. 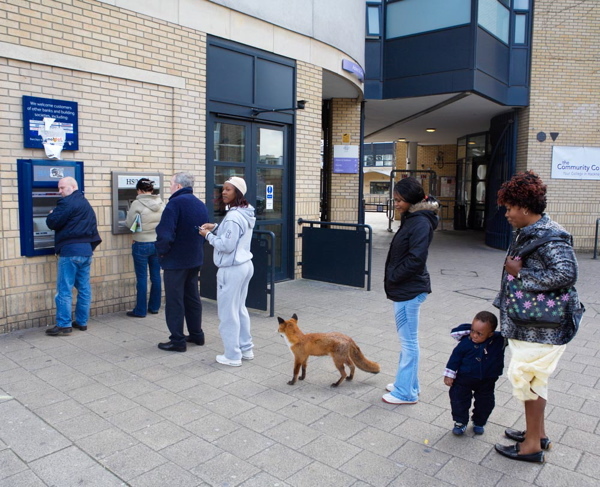 Since foxes appear to be as at home in the East End as we humans are, it would not actually be out of character for them to do any of the things shown here. 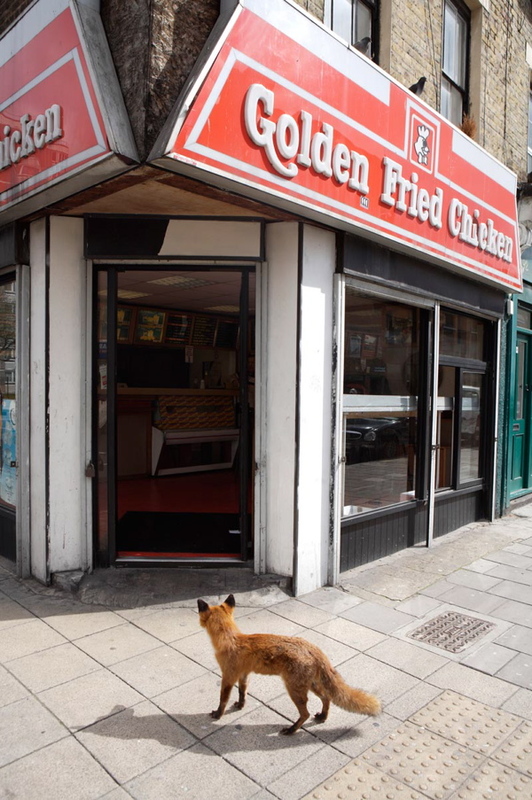 It makes perfect sense to see a fox get cash from a machine and then hit the fried chicken shop. 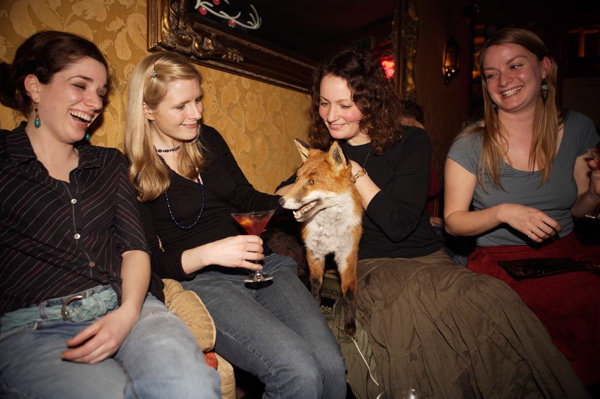 Equally, when I saw the picture of the fox with the girls in the cocktail bar, I could not help wondering if it was a hen night. So you will understand why Martin Usborne’s clever fox photographs stuck a chord, they are only one step removed from actuality – and their subtle irony renders them as playful and engaging satires upon the absurdity of our curious inner-city existence. You may also enjoy Martin’s pictures of Joseph Markovitch of Hoxton. Looks very much like a stuffed fox to me. Always looking the same direction……?